Gear Talk: Kickstand Reviews | One woman. Many bicycles. I love my classic Greenfield kickstand! This has to be the Internet’s most comprehensive and enthusiastic page about kickstands. Thanks, Brian, for the compliment. Hans, nice find, and adjustable too! It looks like it doesn’t come with a mounting plate. Does your bike have a built-in mounting bracket, or did you have to find one separately? I LOVE kickstands and would love to find a nice high-end one for my Sycip road bike since I use it for teaching (and often-times end up laying her on the ground during clinics). Any suggestions? I have the dual-stand on my touring bike and have never had an issue with tipping to the sides — I guess I’m just laterally balanced. The other nice thing about this kickstand is you can vary the weight to the front or rear wheel to aid with repairs and adjustments. Lorri, I think the one that mounts at the rear triangle would work. It’s very quick and easy to install and remove too, so you could slap it on before the clinic and remove it afterwards. I can see how the centerstand is great for touring, but I have had times loading and unloading my grocery bike where I turned away with only one pannier full and it fell over. With the rear mounted one, I just make sure I load that side first and I’m good. It’s not a problem on the Dutch bike, though. She’s so heavy it takes a lot to knock her over. 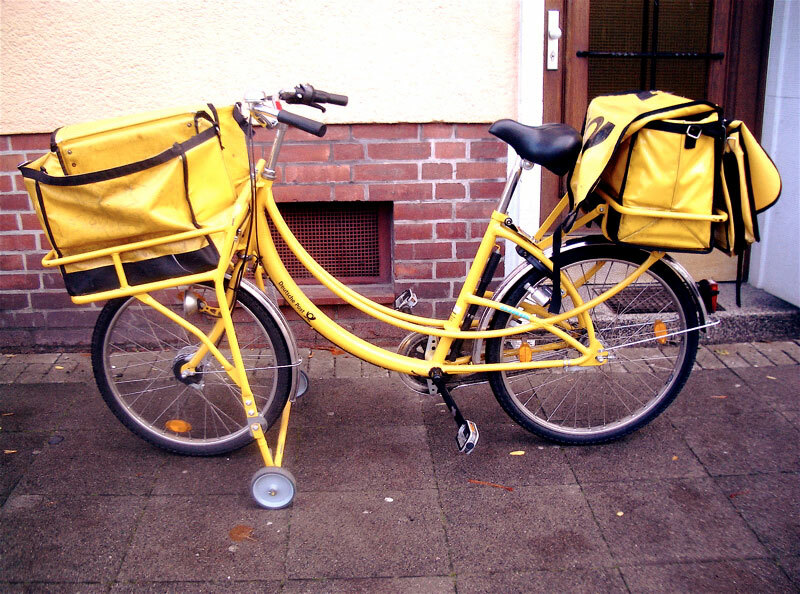 This article reminded me of the German Postal Service bikes. They are meant for frequent stops and of course they are fully packed with mail. I’m using the rear kickstand on my commuter bike. MTB and Race Bike have none – but I don’t need them on these bikes and it would look a bit strange to these pure sport bikes. Rear kickstands works better for me as I have two panniers ( one for clothes / shoes – one for the “OffIce” ), so the Commuter bike is pretty stable with both panniers. Need to be careful that the tab is aligned but it get completely out of the way while peddling. I’ve only seen the UpStand online before, but Lorri of VeloGirls uses that stand for her road bike when she teaches her skills classes. She got tired of picking up and setting down her bike to demo skills. I think she takes it off between classes. Do you use it all the time on your bike? I like the UpStand a lot. I use it for all my clinics and occasionally use it when riding. As Dave noted, you definitely have to align the tab just right or it won’t hold. You also have to tighten the QR skewer down very tightly, which concerns me wrt hub tuning (although the founder says this isn’t a problem). I’d use it on more rides but putting the stand in my jersey pocket is a bit awkward since it’s kinda long. I have the first-generation model and I’ve seen later models. One nice improvement is that they now include a nice velcro strap to hold it together securely (improving the jersey pocket issue). Hmmm, now that I think of it, all my bikes have kickstands except the tourer. I’m not a big fan of the standard single-leg – too many tip-overs, given my obsession with bringing a pannier. I used the chainstay single-leg for years, though now my daily ride has the Pletscher. The Xtracycle-specific double-leg stand is great – you can sit on the bike and relax. The bakfiets has an even burlier version. Perhaps the handiest stand for an unusual application is the Click-Stand (http://www.click-stand.com/) which keeps our tandem upright even when loaded with front and rear bags. Maybe I need to get one for the touring bike too! That Click-Stand is really cool. I may have to order one of those for our tandem. I have a mountain bike that I use for commuting, and when the bike is parked up at home, I really needed a stand. However the bike didn’t come with one, but it did have a mounting system that allowed for certain types to be installed. So I got a Pletscher stand from these guys: http://www.joadsportzsupplies.com.au/index.php?route=product/product&path=25_86_28&product_id=56 and it works like a charm! I have the Civia Double leg kickstand. It is smooth to engage and works on a bicycle without a plate, but is not adjustable in height. So for certain sizes of bicycle – fabulous! Other bicycles – decorative! That’s a clever idea to use both the standard single leg and the rear triangle one. I can see how that would work well. A problem I have had with the chainstay single-leg kickstand on my wife’s bicycle is that it’s too far rear of the center of gravity of the bicycle. If the bike isn’t balanced carefully, it will fall over. Another type of stand that I love, although not technically a kickstand, is the Rhode Gear Flickstand. It’s a small clip that keeps the front wheel from turning (left/right or around) which makes the bike more stable when it’s leaning against a wall or bike rack. I don’t think they’re made any more; I found mine on eBay. You’re right about the chainstay kickstand. I find it happens mostly when the load isn’t balanced, but if I angle the front wheel carefully to counterbalance, it helps. Thank you! In working with the boys at the Monterey County Youth Center bike class, the kickstand on my bike (vs none on the bikes of the other teachers) has made for some good-natured chat. When a boy was working on a bike for his mom, I encouraged him to add a kickstand if she runs errands by bike. Next time the boys are pondering our little box of used kickstands, I’ll tell them about your post. I’ve also added a link to your post to Bicycling Monterey’s “Shopping by Bike” section. Thanks to Richard Masoner of Cyclelicious for bringing this post to my attention. I have a long wheelbase recumbent (a Vanguard). I have yet to see a kickstand that has any chance of working with it. I’ve also found that kickstand is not that essential (even with a Trail-A-Bike or when grocery shopping). I always park my bike against a post or U rack (so I can lock it securely), so I’ve not often had it fall over. Pingback: Gear Talk: An Upstanding Kickstand for Roadies | One woman. Many bicycles. Sorry about your comment getting eaten and thanks for taking the time to chime in again with the compliment! Advice on blogging? That could be a blog post. 🙂 The first things that come to mind are to keep it true to who you are and where you live, and dig a little deeper to get to the emotion behind or an underlying truth of the story you’re telling. And use photos to tell the story. You don’t need to be a photographer to do that. I take all of mine with my cellphone. I installed a Pletscher double stand on my Oxford Bikes tourer, and it tips over very easily. Why would that be? I am now looking to replace the kickstand. Did you leave the legs too long? Are they cut to the correct length. Maybe you cut too much off. Came across you post while looking at kickstand info. Just thought I’d tell you my daughter’s name is Zella Mae. Weird!